Have you noticed how more and more quirky, fun, witty and touching posters with quotes are ‘pinning’ up all over the place (pun intended). I love it! Here are a few I found whilst browsing aimlessly (well not really seen as I found a purpose to the browse), on online and on etsy. This print is entitled “Break the Routine” available from Dazychic’s shop. I like it becuase it is one of those ‘stop, reflect and slow down’ posters. I also love the dandy-lion illustration. This British WWII poster has almost been over printed. It is everywhere and has been transferred onto just about any surface: bags, necklaces, t-shirts, wall decals … you name it. BUT, I still want one. :) They are available from a number of etsy stores but this dashing red one is from Printstop’s shop. 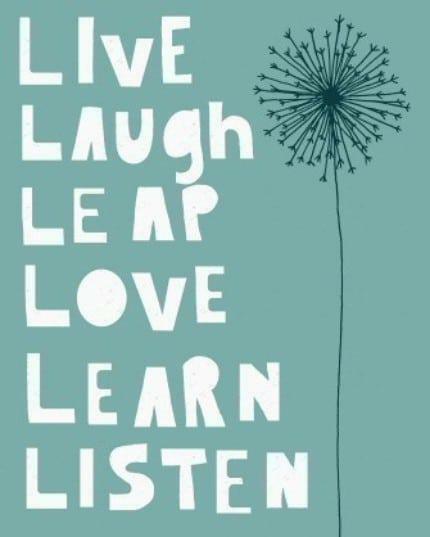 This is not a poster but I loved the quote. It is actually printed onto a tote bag. 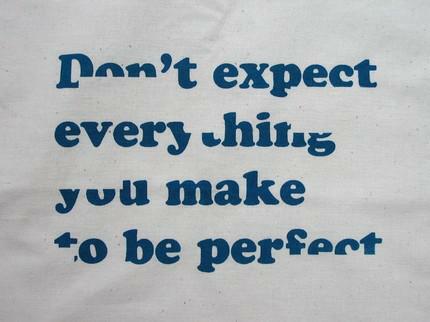 I need this as a poster above my sewing machine. Available from linocutboy’s etsy shop. 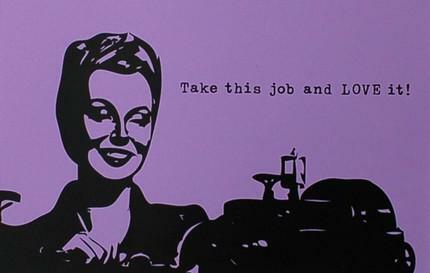 This “take this job and LOVE it” poster is available from Blulima’s etsy shop in any colour you desire. Obama’s face and his quotes can also be found all over the place. 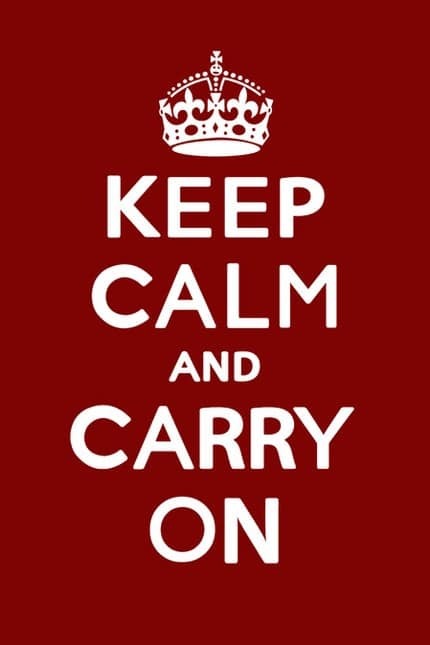 It has not quite reached the popularity of “Keep Calm & Carry on” but I it will with time. I am not a fan of portraits or of putting people on pedastols, or in this case, on posters on my walls – I never even had a Hollywood movie star on my wall growing up. 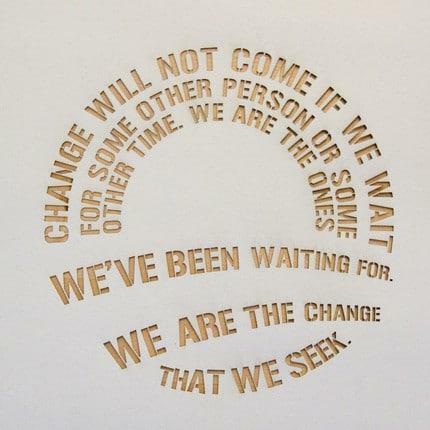 But, this stencil poster is different. The message is terrific, inspiring and uplifting. I’m not sure if I want one, but I like it. It is available from Obamastuff’s shop. I couldn’t help myself- isn’t this poster a ‘must have’! Available from the Keep Calm Gallery online. I wonder if they do a coffee one…. These are not posters but cards. I LOOVEE THEM! I will need to put one of my mirror, door and inside my bag to remind me to stand up straight, smile and feel pretty. :) I also think it would make a great ‘angel’ gift (the kind of gift you give anonomously). Also available from the Keep Calm Gallery online. This entry was posted in Blog and tagged Keep Calm & Carry on, Keep calm and carry on, Posters, postive posters, screen printed posters, WWII posters. It’s not about being first. I love the “TEA REVIVES YOU” one. The cards are perfect for those days you need a pep-up and you accidentally come across one of those in your bag. I like the first poster.It looks very nice!